Home » Welcome to NAM! promoting the mathematical development of all underrepresented minorities. NAM was founded in 1969; in 2019, we will celebrate our 50th anniversary. The mission and associated purposes lead to the following specific major goals of NAM. To engage in activities, projects, programs, conferences, workshops, seminars, etc. which are designed to inspire, motivate, promote, and assist persons of all ages to seek, embark or maintain an active interest/career affinity in some area(s) of the mathematical sciences. To promote and assist in the continued professional development of practicing mathematical scientists and educators, especially those groups that are underrepresented in the mathematical sciences. To support the continued development of excellence in teaching and curriculum enhancement in the mathematical sciences, especially at Historic Black Colleges and Universities/Minority Institutions. To advocate, promote and support research in the mathematical sciences, especially for underrepresented minorities. 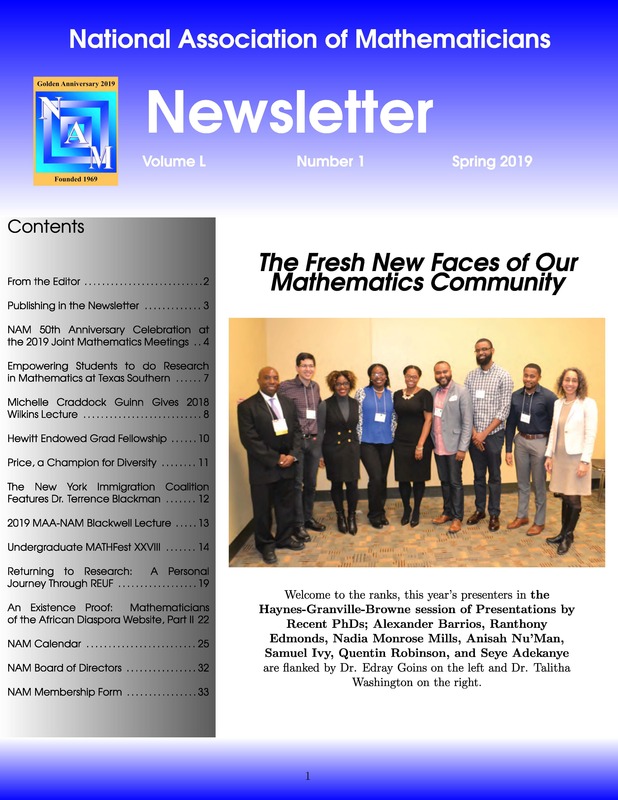 To increase the mathematical sciences community and general public's awareness of issues of importance in areas of the mathematical sciences, especially those that are of great interest to underrepresented minorities. 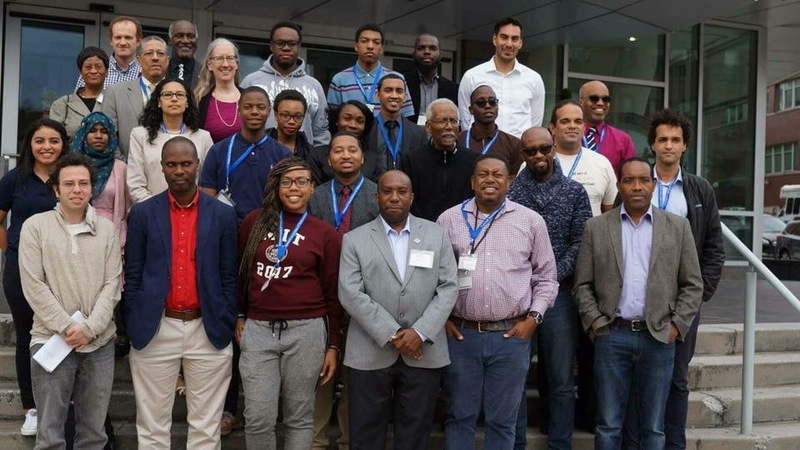 While the membership is open to everyone, NAM seeks is to promote excellence in the mathematical sciences for underrepresented american minorities in general and African-Americans in particular. We have over 500 members, and hope that you will join and become one as well! NAM has an official Statement on President Donald Trump's "Muslim Ban".  Our website has a new look and feel as we kick off our "Golden Anniversary" Capital Campaign: we will raise $2,000,000 by our 50th anniversary in 2019. We very excited about the future of the organization, and are looking forward to having you join us! Register for free to join our mailing list; you can decide later which type of Member you would like to become. NAM is a non-profit organization, EIN 51-0183976. As such, we are eligible to receive tax-deductible charitable contributions. We welcome all donations!